Full Circle’s management program considers the “whole” horse as an individual to accentuate and enhance strong points and to strengthen weaknesses. Physical, environmental, social, and nutritional needs, as well as biomechanics are addressed. Our team of professionals is dedicated to keeping your horse healthy and fit. Full Circle Farm offers boarding services with individualized care for each horse’s specific needs for the physical and mental well-being of your horse. The board includes daily personalized feed programs, with nutritional and health considerations. Each horse will have its own tailored schedule for shoeing, massage and veterinarian requirements. Full Circle has a team of dedicated professionals to keep your horse performing at his best. In addition we offer a variety of customized training packages for all levels for horse and rider. Professional training by Kristen Guadagnino. Short and long term training for hunters and jumpers available. Extensive experience in starting young horses for the A show ring. Advanced training for the competition horse, as well as corrective training is offered. 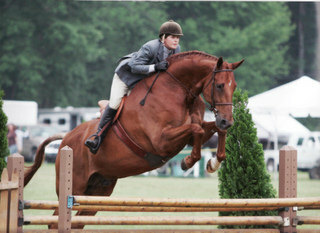 We offer hunter and jumper lessons for all ages from beginner to advanced on your horse or ours. Contact us for more information. Kristen Guadagnino has had extensive experience starting young horses. She has an intuitive uinderstanding of what each horse needs as an individual. Corrective training is also available for horses at any stage of training.